COLLEGEDALE, Tenn. --- While Seventh-day Adventist opinions on Adventist former neurosurgeon Ben Carson's presidential candidacy have been all over the map, a large, Adventist-owned corporation has given the surgeon his most valuable endorsement to date. Days from the Iowa Republican Caucuses, Little Debbie Snack Cakes (made by Adventist-owned McKee Foods) publicly endorsed Carson: "We briefly considered endorsing Senator Ted Cruz because his wife is the daughter of Adventist missionaries," said Little Debbie spokesperson Dema Siado. "But even with Heidi, Cruz can't compete with Dr. Carson who, prior to running for president, has given a generation of Adventists an unshakeable confidence that their kids will grow up to be surgeons." Carson, who has slipped in popularity since a brief spell atop the GOP polls in late 2015, gladly accepted the Little Debbie endorsement. Expressing his gratitude he cited "the many times I've sunk my teeth into a Nutty Bar on the campaign trail." 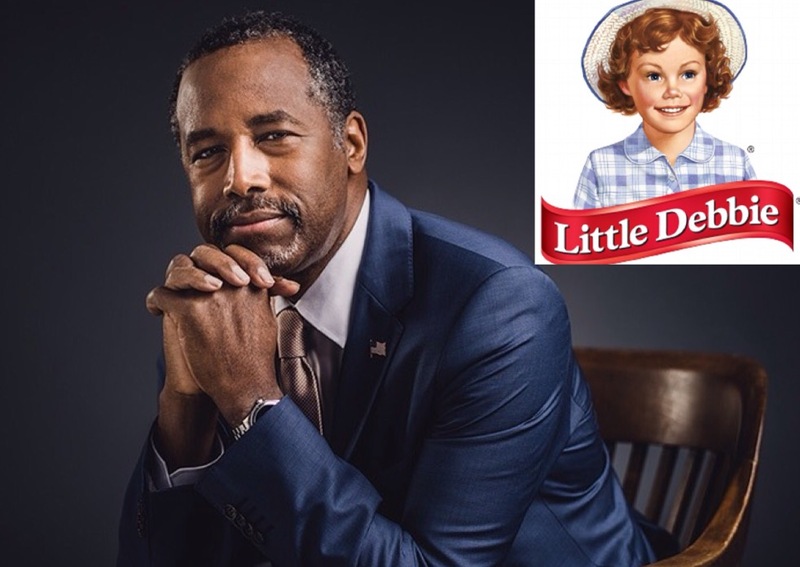 Although Little Debbie said they fully believed in Carson as a candidate, Siado said that if, for any reason, things did not go as planned, they would be willing to offer Carson a post-election role as Little Debbie Healthy Eating Ambassador. Little Debbie’s is Instant Diabetes. Little Debbie’s keeps lots of Adventist (and Un-Adventist) doctors in new Cadillacs. Well, so much for the Adventist Health Message! What would EGW think? I feel sorry for the Little Debbie’s spokesperson, “Dema Siado.” She must have eaten “Too Much” of those fat-filled, sugar-packed, calorie-whopping cakes. How ironic that Dr. Carson might be invited to serve as their ambassador of “healthy” eating. As Ben Carson said as his closing statement at the debate last night, “We the People of the United States, in Order to form a more perfect Union, establish Justice, insure domestic Tranquility, provide for the common defense, promote the general Welfare, and secure the Blessings of Liberty to ourselves and our Posterity, do ordain and establish this Constitution for the United States of America.” I don’t see anywhere in there where the Founding Fathers ordained Little Debbie junk food as a healthy alternative. . . . WARNING: The Surgeon Generals have determined that consuming empty calories, large quantities of sodium, and massive amounts of sugar and fat is dangerous to your health. Little Debbies are not a healthy alternative to smoking cigarettes or eating meat. Preach it, Surgeon! It’s about time that somebody gets my health message straight, and we stop kidding ourselves about McKee’s junk “food” being good for anything besides profits. I endorse Little Debbie because they endorse me. I’m not pretending they’re good for you; I’m just not getting into that issue. As long as they contribute to my campaign, I’ll be glad to say that eating junk doesn’t turn you into a garbage can. Money talks! “The whiter the bread, the sooner you’re dead.” The more junk food you got, the sooner you rot. My inside sources tell me that the McKee Bakeries will come out with a new line of pastries this summer of 2016 using the trade marked name, “Little Bennies” with all of its extras. This stuff will be a big hit at the GOP convention and well into the 2020 GC Session at the Dome in Indianapolis. SDA institutions will want to carry it in the cafeterias, vending machines, alumni meetings, seminars. The whole nine yards. “All the goodness you can eat” is the slogan. Who wants to get in on the ground floor? Call my lawyer. I think you loco. “Little Bennies” is wacked. Santa no is real. He fake. Ben fake also. Sevvy no has nothing better about to write. He like invent news that is no news. He lose time by write crap. Debería escribir anuncios políticos de hip-hop para Ben Carsón.